Firefighters arriving at the Villa Barone in Mahopac on Saturday evening were greeted by a heavy concentration of smoke. Chief Bill Nikisher sounded a general alarm for his department and requested mutual aid from the Mahopac Falls, Carmel, Croton Falls and Yorktown Fire Departments. 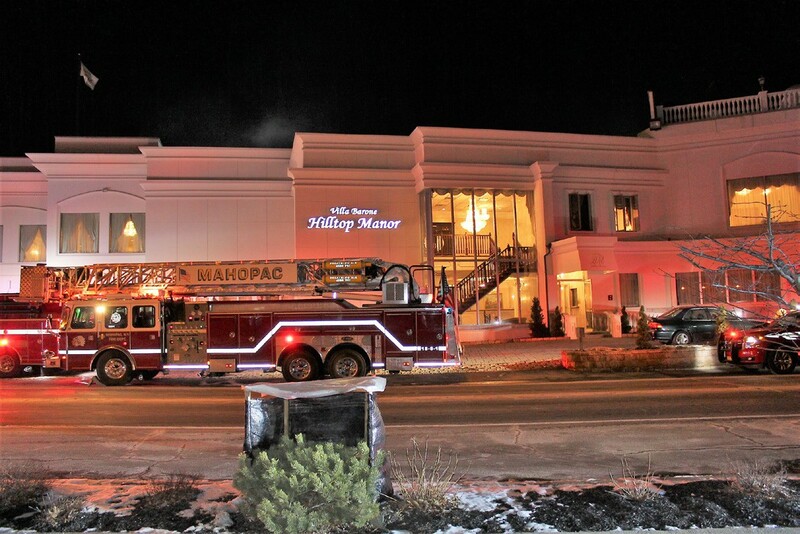 Fire crews traced the origin of the smoke to a fire in a laundry room at the sprawling banquet hall on Route 6. Chief Nikisher said a machine drying linens ignited which sent smoke throughout the first and second floors. The fire initially reported at 7:45 pm was quickly extinguished and crews spent 90 minutes removing the smoke with exhaust fans. The chief credited the facility’s automatic smoke alarm which notified Carmel PD for averting a major calamity since the resort was closed for the weekend. No injuries were reported and fire crews cleared the scene around 9:30 pm. Assisting at the scene were Putnam Battalion 15 Coordinator Doug Casey of Kent and Battalion 18 Coordinator Shawn Keeler of Putnam Valley along with the Putnam Fire Investigation Team and Carmel Police Officer Vincent Serio. Members of the Mahopac FD Fire Police handled traffic control.